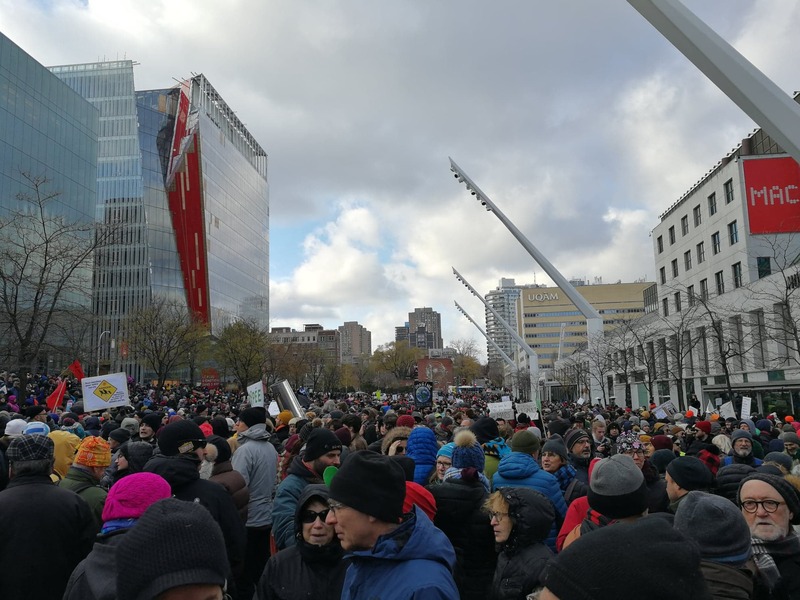 On November 10th, the environmental movement La Planète s’invite au Parlement (“The Planet Goes to Parliament”) held a Quebec-wide march for the environment. Approximately 50,000 people of all ages attended the “festive family event” in Montreal, including Quebec’s environment minister Marie Chantal Chassé, Montreal Mayor Valerie Plante, and opposition party MLAs; while others marched in ten additional locations, including Sherbrooke, Quebec City, and the Gaspé. While Quebec is only the beginning – the movement aims to spread across the country – the event was especially pertinent considering Premier Francois Legault’s choice not to attend the UN Climate Summit in December, as well as increasingly vocal opposition from Canadian conservatives – including Ontarian Premier Doug Ford and Federal Leader of Opposition Andrew Scheer – towards government legislation forcing provinces to adopt a carbon tax. A view of the crowd filling Montreal’s Place Des Arts during the November 10th march. Photo taken by Alexandra Yiannoutsos. Inspired by a record-breaking heat-wave last summer responsible for a 30% increase in emergency service calls and the death of over 90 people in Quebec alone, the group describes themselves as “independent and non-partisan” citizens driven only by “our will to see our governments take appropriate action.” The organizers of the event listed demands for elected representatives to “recognize that the climate emergency and the protection of biodiversity are the greatest challenges of our time and raise public awareness about them”. More specifically, they call for the development of a “climate plan that reduces GHG emissions by 45% by 2030 (compared to 2010 levels) and eliminates them completely by 2050” alongside a yearly report tracking progress on this and the banning of additional oil and gas exploration. A march participant dressed as a bear to represent climate change’s effects on wildlife. Photo taken by Alexandra Yiannoutsos. Despite this urgency, some politicians remain ambivalent or actively resist enacting environmentally friendly legislation. A coalition of eleven environment groups ranked Legault’s Coalition Avenir Quebec (CAQ) policies lowest of Quebec’s four largest parties. Critics have also argued that the CAQ’s plans to expand infrastructure across the Saint Lawrence River poses an environmental risk and that their public transit investment, one of the many strategies to mitigate climate change, is not enough. In Ontario, Premier Doug Ford branded Trudeau’s federal carbon tax plan as “ineffective”, threatening legal action if the plan is rolled out, while at least according to Ontario’s environmental commissioner – a position since eliminated by Ford’s government – “gutting” the province’s climate change programmes. This political skirmish played out despite economists William Nordhaus and Paul Romer winning the Nobel Peace Prize for their research proving the long-term sustainability of environmental policies such as carbon taxes. A march participant carries a poster with Beatles lyrics. Photo taken by Alexandra Yiannoutsos. While arguments play out on the political field, the November 10th march and its co-events across Quebec reveal that large portions of the population are concerned about the environment and are demanding action from their representatives. It remains to be seen how the provincial government will react to the march. Particularly, it is uncertain whether any of the demands made by the movement will be met. Even so, this march – the fourth recurring one hosted by the group – garnered massive crowds, media coverage, and acknowledgment by political figures. Considering their intent to organize these events until their demands are met, combined with an openness to all, it will be interesting to see whether they can continue to gain traction. La Planète s’invite au Parlement has more marches planned for December 8th during the Warsaw Climate Summit, including at Montreal’s Place du Canada. The event description is currently only in French.